Normally I run to Costco shopping after dropping my son to pre-school as those are the few hours I can shop peacefully since I have to manage only my daughter while I shop. Last weekend I ran out of milk and did not want to drive to Costco since I had a lot of house cleaning and chores to be done. So I asked my husband to go to Costco and he took my son along with him so that things can be a bit easy for me. Costco always have some demo food in progress and my husband came back with this frozen four cheese ravioli saying they had the demo and our son really loved it. Next day I wanted to make this Ravioli for my son before he is back from school, but did not have any ready made pasta sauce but yea I had a lot of very fresh farm picked tomatoes which I really wanted use liberally to make something good. So I planned to use it to make some fresh tomato sauce and it resulted in a better sauce than the store bought ones. You can use the same with pastas as well, just make the tomato sauce at home instead buying it. So friends this is my way of making the four cheese ravioli with fresh Tomato sauce. Enjoy!!!! Heat up a pan in medium heat, add olive oil, add onion and garlic and saute for a while. Add pepper, salt and basil leaves and stir well. Add the chopped tomatoes, stir well. When the sauce starts to boil reduce the flame to low-med and cook breaking the tomatoes, stirring occasionally until sauce reduces and thicken. Switch off the flame. 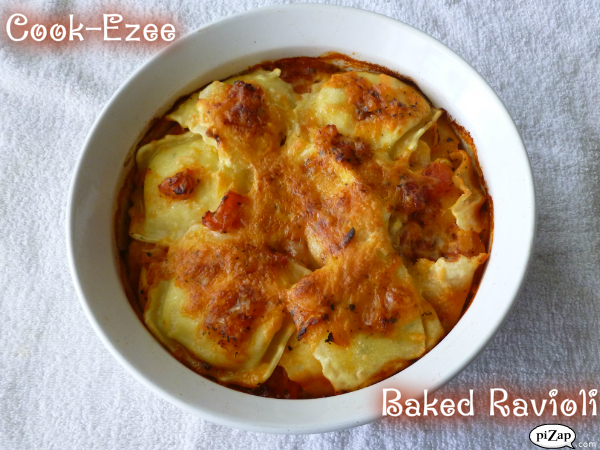 Grease a baking dish, layer with some ravioli topped with tomato sauce and shredded cheese. Bake for 20-25 mins or until golden color on top. Take out of the oven and let it cool for a while. 1. You can use any shredded cheese or cheese blend available in your kitchen. 2. If you have dry parsley leaves you can add 1 tsp of it along with dry basil laves while making the sauce. 3. You can make this tomato sauce in bulk and keep this refrigerated for at least a month and use for any pasta of your choice. Very yummy, thanks for sharing the basic tomato sauce recipe, ravioli looks very inviting..
І really love youг blоg.. Great colors & themе. Diԁ you mаκe this amazіng ѕite yourself? Please reρly back as I'm trying to create my very own blog and would love to find out where you got this from or what the theme is called. Thanks!